After a week of largely comprehensive successes in the T20 Qualifiers, Ireland’s women came out on top in the most dramatic of series finals against Bangladesh on Saturday, with the contest only decided in the very last ball of the match. It was a game that had everything- ending with the umpires forced to adjudge on a “Mankad”- style run-out off what would have been the final delivery with the scores tied and thunder and lightning rapidly closing in on the Terdthai Ground in Bangkok. Salma Khatun sent down the 20th over for the Tigers with Ireland needing 9 to win but Laura Delany and Lucy O’Reilly managed to get 8 from the first 5 to tie it up. 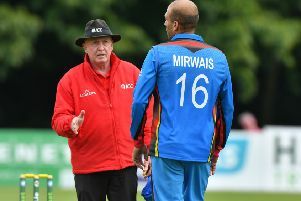 Khatun then attempted to run out Delany without delivering the last ball but after much deliberation the umpires ruled against the bowler’s appeal. O’Reilly gleefully thumped the actual final delivery - a rank long hop - to the midwicket boundary to spark wild celebrations in the Irish camp. Having won the toss and opted to bat first, Bangladesh lost Sharmin Akhter (9) and Lata Mondel to successive balls from Ciara Metcalfe to leave them 21-2 early on. A 74-run stand between Nigar Sultana and Rumana Ahmed then had Ireland very much on the back foot before Metcalfe again came to the rescue, dismissing the former for an impressive 41. Ahmed was unbeaten on 38 when the overs were up- Bangladesh with a very competitive 105 for 3 from their allotted overs while for the fielding side, Metcalfe was the stand-out with 3-14. Cecilia Joyce and Clare Shillington gave their side’s reply a solid start with 24 before Shillington was bowled by Ahmed for 12 (from just 7 balls). A couple of quick wickets for Akhter- Kim Garth (2) and Cath Dalton (5) followed by the run-out of skipper Isobel Joyce for 8 got Bangladesh right back into contention however and it was all-square at half-way. Delany then entered the fray and batted with great composure and with heavy rain enveloping the ground a valuable stand of 24 between her and Gaby Lewis (11) edged the batting side back in front. There was more drama to come however as Lewis and then her sister, Robyn, were both involved in run-outs as indecision threatened to ruin Ireland’s day. Delany stood firm at the other end and was there unbeaten on 26 as the frenetic conclusion was played out before a delighted Isobel Joyce was called forward to receive the trophy. Player-of-the match, and indeed the series overall was the excellent Rumana Ahmed - who cut a totally despondent figure as she collected both consolation prizes. Twin sisters Isobel and Cecelia Joyce finished second and third in the tournament player rankings. Speaking after the final, a delighted Ireland captain Isobel Joyce said: “It’s an amazing feeling and I’m so proud of my team for getting over the line in really tough conditions. “Bangladesh are an excellent bowling team, especially Salma Khatun who was bowling the last over, who is so experienced and would back herself every time to keep any team under eight runs. “I’m really delighted for Laura Delany because she didn’t have it her own way during her innings, but she stuck in and was there to help the team and Lucy O’Reilly over the line. “The team took it one ball at a time, which is important especially in Twenty20 rather than thinking about the whole match which can overwhelm you, because if we needed 12 or 13 runs off the last over it might have been too much. This was a thoroughly deserved win for an Ireland side that has really impressed in all their disciplines this week, and one that will surely further raise the profile of Irish cricket on an International stage in India next year at the T20 World Cup.